Mt. 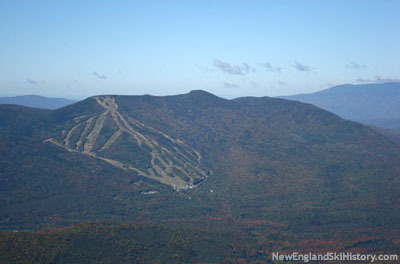 Tecumseh stands tall over Waterville Valley with an elevation of just over 4,000 feet. While the Waterville Valley Ski Area does not approach that elevation, skiers were once able to, thanks to the original CCC ski trail. That trail was later replaced by a second CCC ski trail, which would later be absorbed by the current lift-served ski area. The first Mt. Tecumseh Ski Trail was cut in 1934, running to the west of the current Mt. Tecumseh hiking trail, from the Tripoli Road vicinity to the summit area. The vertical drop of the trail was around 2,400 feet. The trail was abandoned sometime after 1940. The second Mt. Tecumseh Ski Trail was cut by the CCC in 1937, running from Tripoli Road to a subpeak of Mt. Tecumseh. 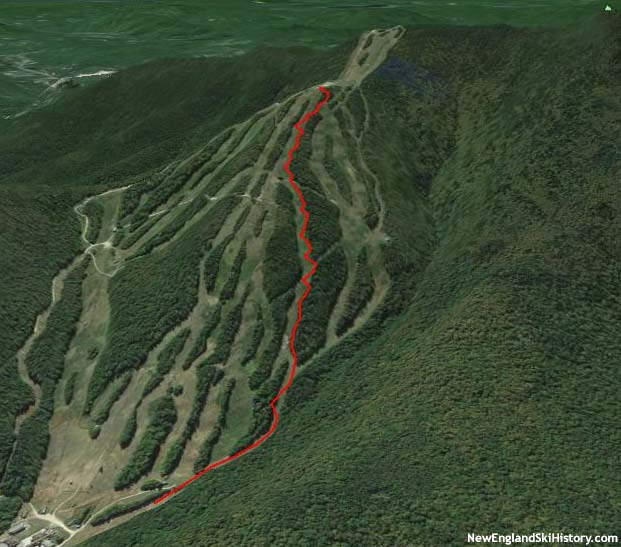 A few hundred vertical feet shorter than the old trail, the new trail continued to exist as a ski trail through the early 1960s, at which point it was incorporated into the new (1965) Waterville Valley Ski Area. The trail started near the present day top terminal of the White Peaks Quad, cut over to upper Tippecanoe, then down White Caps, Terry's Trail, Old Tecumseh, Lower Periphery, and into the Pasture slope. 2013 Aerial Rendering, New Mt. Tecumseh Trail in red.
" 1934: First ski trail on mountain is cut. Old logging camp on lower E slope is converted to public ski cabin. " " Mount Tecumseh Ski Trail. This trail ascends the E. slope of Mt. Tecumseh. It starts from the Osceola Trail in common with the Tecumseh Trail as described above, the two coinciding along a logging road as far as the abandoned logging camp. The ski trail keeps to the L. of the buildings, straight up the hill, and again follows a logging road for about 1/3 m. to a clearing. From here it bears L. up-hill through the clearing, continuing W. and up by zigzags. Then it slabs across and up the slope, entering the Tecumseh Trail just below the summit. The first mile requires 10 inches of snow and is suitable for novices; the upper part requires 18 to 20 inches of snow and is for intermediate and expert skiers. The normal width is 8 to 10 ft., but the curves on the upper slopes widen out to 15 to 60 ft. The total drop is 2,400 ft.; distance about 2 3/4 m. "
" 1937: Forest Service approves construction of new ski trail (Tecumseh Trail) on mountain. Work is done by CCC. Trail runs two miles down to Tripoli Road with vertical descent of 1900 ft. "
" Tecumseh Trail (W.M.N.F.). From Waterville Valley up E. side to summit of Mt. Tecumseh. Signs lead from Waterville Inn. Length 2.75 m. Max grade 20º. Suitable for intermediate skier. Two open practice areas, the upper one being steeper and the lower one being located behind a public cabin, 1 m. from foot of trail, equipped only with bunks and stove. " " Mount Tecumseh Ski trail (Old) (WMNF). This trail ascends the E slope of Mt. Tecumseh. It starts from the Tripoli Road, 100 ft. N of the Tecumseh Trail entrance. It converges with the Tecumseh Trail at 0.4 m. and coincides with it along the logging road to the ski slope. It goes up across the ski slope and follows the R fork as it enters the woods, while the new Mount Tecumseh Ski Trail diverges L. It follows a logging road for about 1/3 m. to a clearing. It then bears L up-hill through the clearing, continuing W and up by zigzags. It slabs across and up the slope, entering the Tecumseh Trail just below the summit. Total drop is about 2,400 ft. in 2 3/4 m. "
" 1940: Forest Service considers, rejects proposal for installation of ski lift on Tecumseh Trail. " "  Eventually a single Mt. Tecumseh Trail is designated, using old ski trail and parts of fire barrier and Johnson Brook Trail. " " Mount Tecumseh Ski trail (New) (WMNF). For the first mile this trail coincides with the old Mount Tecumseh Ski Trail, leaving the Tripoli Road to the W 2 m. from the intersection of the Tripoli Road with the Mad River Road, the elevation being 1600 ft. At 1 m. the Tecumseh Ski shelter is located on the R at an elevation of approximately 2,090 ft. Here the old Ski Trail branches R, the new trail bearing L. A ski first aid cache is located at the intersection of the two trails. At 1.2 m. there is an excellent view of Mt. Tripyramid, Mt. Osceola and Mad River Notch. At 1.3 m. heavy timber growth begins. At 2.0 m. the upper terminus of the trail is reached on the top of a SE spur of Mt. Tecumseh - elevation 3,417 ft. On the upper section splendid views of the cone of Mount Washington are obtained. There is a drop of approximately 1327 feet in the upper mile of this trail, and because of the excellent views, this trail should become popular for summer use. " " Waterville Valley will be the scene of the U.S.E.A.S.A. women's downhill, slalom and combined championships on Jan. 17 and 18. " " Mount Tecumseh Ski Trail (WMNF). For the first mile this trail coincides with the old Mount Tecumseh Ski Trail, leaving the Tripoli Road to the W 2 m. from the intersection of the Tripoli Road with the Mad River Road, the elevation being 1600 ft. At 1 m., at an elevation of approximately 2,090 ft., the Mt. Tecumseh Trail branches R, the ski trail bearing L. A ski first aid cache is located at the intersection of the two trails. At 1.2 m. there is an excellent view of Mt. Tripyramid, Mt. Osceola and Mad River Notch. At 1.3 m. heavy timber growth begins. At 2.0 m. the upper terminus of the trail is reached on the top of a SE spur of Mt. 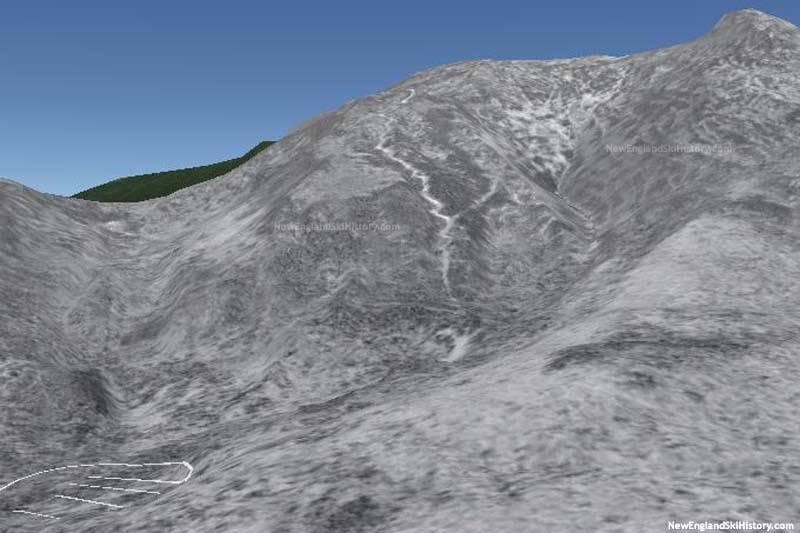 Tecumseh - elevation 3,417 ft. On the upper section splended views of the cone of Mount Washington are obtained. " " Mount Tecumseh Ski Trail (WMNF). This trail ascends the E slope of Mt. Tecumseh. It leaves the W side of Tripoli Road 0.1 m. N of its juct. with the road access the W branch to the Inn. It follows an old logging road for 1 m. to an old meadow where the Mt. Tecumseh Trail leaves R. A ski first aid cache is located at the diversion of the two trails. The ski trail begins to ascend more steeply, in a generally W direction, and at 1.2 m. there is an excellent view of Mt. Tripyramid, Mt. Osceola and Mad River Notch. At 1.3 m. heavy timber growth begins. At 2.0 m. the upper terminus is reached on the top of a SE spur of Mt. Tecumseh - elevation 3417 ft. On the upper section there are fine views of the cone of Mount Washington. " " 1965: Former Olympic skier Tom Corcoran and his Waterville Company open new Mt. Tecumseh Ski Area. Shortly thereafter WVAIA opens Sosman Trail along ridgecrest. " "New Hampshire Communities Schedule Many Outstanding Winter Sports Events" Boston Globe. 11 January 1948. Smith, Steven D. and Mike Dickerman. The 4000-Footers of the White Mountains: A Guide and History. Second edition. Littleton, NH: Bondcliff Books, 2008.